Niger Peak is an easy scramble from the road, either by the South East Ridge from just north of Leaping Burn or by the tussock slopes south of Niger Stream. The climb would take about four to five hours from the road to the summit. 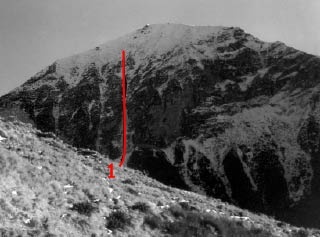 This route is on the South side of Niger Peak above the Matuktuki Station, R Ewing’s property and can be seen from the Matukituki road, on a line of bluffs overlooking the gorge of Niger Stream. It takes about three hours to reach the base of the route via a sheep track on the true right of Niger Stream. This track wends its way under a line of bluffs and comes out above the gorge. Cross the stream and head up and through scrappy bush to reach the bottom of the route. The alpine scrub getting to the bottom of the route is jungle like and time consuming. Cardrona Cafe Girls is the right hand line and is about two pitches in length. The crux is at half height and is a small vertical step. If this is wet and dripping a detour can be made out right via an interesting section of mixed frozen tussock and blobs of ice. The slopes above appear to be active avalanche zones. If there is any doubt about stability perhaps rappeling the route would be a good idea. There is good bouldering and a small beautiful chandelier in the clearing above the stream gorge.